I left this one a few categories ago promising to revisit it. I struggled because I’m not on board with the concept of a “guilty pleasure”. Why be ashamed of something you enjoy (ethically)? Just because you’re a PhD who secretly likes to watch the Biggest Loser doesn’t make you Humbert Humbert. I ended up choosing something that would betray my hypocrisy – something that I decry publicly, but enjoy privately. Coach’s Corner is such a show. 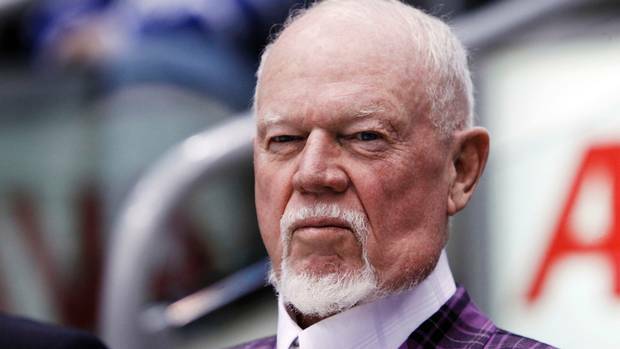 Don Cherry, like Donald Trump or Snooki, is a polarizing figure who makes for great television. Although, most of his detractors aren’t hockey fans; outsiders who are bewildered by Cherry’s garish outfits and arrogant demeanor. However, I’m a hockey fanatic and I don’t like Cherry. I find him boorish; I hate his easy bigotry; and, most of all, I despise his hardliner stance on normative on-ice behavior (“the code”, etc.). At his worst, Cherry is a moth-eaten traditionalist who wants to stick hockey in a museum, hiding it away from modern audiences as it collects cobwebs. Nonetheless, I still tune in for Coach’s Corner whenever I watch Hockey Night in Canada. Despite everything I just said, Cherry has the ability to surprise, which is so extraordinarily rare in today’s media personalities. And I don’t mean that in a “I can’t believe Don actually said that!” or “He’s gone too far this time!”. That’s all par for the course with Coach’s Corner. I mean that Cherry can sometimes approach the game with a perspective that is radically unique. The complexity of Cherry’s character is often overlooked. He’s often identified as a straight shooter, what you is what you get, and all those marketable cliches. Still, while Cherry is excruciatingly conservative, he isn’t afraid to challenge to norm when it comes to player safety. For example, Cherry has long championed no touch icing. He loves fighting, but he disparages staged fights. However untenable his positions may be, his desire to protect players is sincere, and he’s not afraid to espouse unpopular positions. He’s also one of the few big personalities in a sport starving for personality. 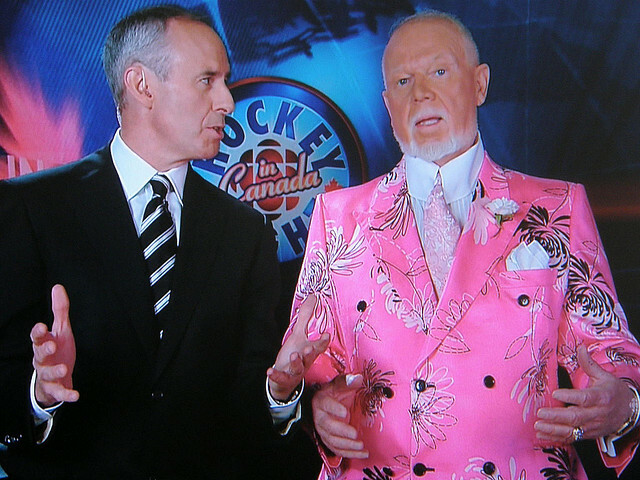 His flamboyant costumes, comical chemistry with Ron MacLean, and repertoire of catch phrases (“what a beauty!”) all create a brand that betrays his conservatism. In the end, you get a guy wearing a pink paisley tuxedo who castigates a player for playing to the crowd after a goal. In short, Cherry is a tissue of contradictions. His personality clashes as much as his suits. These days, unfortunately, Cherry has descended into self-parody. Not to be a ageist, but he’s getting old and the league is passing him by. I say league because Cherry still has valid things to say about the game; it’s the audiences and players that he can no longer understand. He’s becoming that grandfather everyone loves, but pushes up the stairs whenever guests arrive. Usually I don’t read the news, just the sports but I happened to pick up the paper and read the front part the other day. 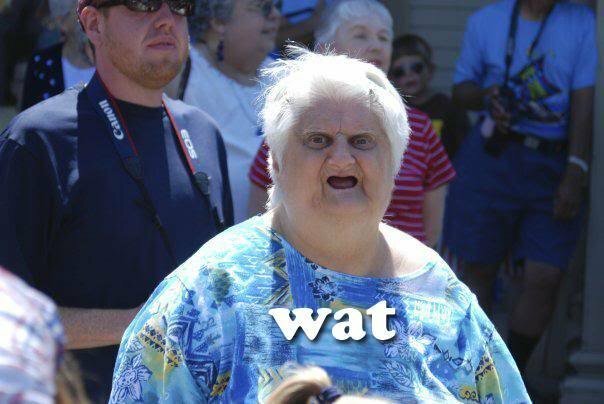 First, there was a photo fo a jogger kicking and destroying Canadian flag and gives a woman the finger. Then it continues, my buddy the mayor getting sued, Oliva Chow next mayor, man slits wife’s throat, kills her…What happened to Toronto the good? Remember we couldn’t get liquor on Sunday’s? Poor us. What should we call Toronto now? All this crime and people want the Police budget cut. Go figure. Cherry’s routine is just getting sloppy. He’s not the same Don these days. I don’t wish the guy ill because I value his status in the game, but he ought to bow out before getting forced out, or worse: pull a Tom Flanagan. But, then again, that would be Don’s style. ~ by braddunne on March 10, 2013.